Corrida is 10 months old but its brunch menu is brand new, and it’s impressive. 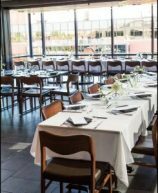 Bryan Dayton and Amos Watts opened the Basque region inspired steakhouse on the rooftop atop the Pearl West Building with floor to ceiling views of Chautauqua and Flagstaff and optional outdoor seating. Welcome to brunch. Drinks are a definite part of the equation. Start your meal with a clarified Bloody Mary, made from consommé gazpacho and topped with a hot pepper or enjoy a Boxcar French Press coffee for the table. Then go ahead and order a vermut (vermouth), it’s gluten-free, made from grapes, and has a very low alcohol content. Try the Blanco, the Adonis, or the Seco for a robust experience. Brunch can be sweet with a brioche topped with apple compote, or choose the popular patatas con chorizo, sausage, potatoes, and two eggs over easy. The bistec y huevos is the flatiron steak with eggs and a vinaigrette. Gambas y arroz is an expected Spanish dish, with paella-esque prawns, saffron rice, tomatoes, and poached eggs. Corrida also offers more Americanized brunch classic, like the salchicha y brioche – a Spanish take on biscuits and gravy – or a hamburguesa. Saddle up to the soft white leather mahogany bar and order from the mixologist/GM Andreas who cut his teeth at some of the finest restaurants in New York City and the world, and enjoy a sip of Spain with a Boulder touch. You may just stay at the bar until lunch comes, enjoying kalimotxos (red wine and coke!) and gin and tonics made with trakal, homemade citrus tonic, berries and mint. Boulder’s much-anticipated new carnivore option, Steakhouse No. 316, brings Aspen high luxury to Pearl Street. Owners Craig and Samantha Cordts-Pearce deliver a beautifully retro ambiance, with checkered tiles and red velvet couches, and tables for two elegantly decorated in red and gold French stripe upholstery. A fireplace decorates the back room which can be made private and the front room boasts slightly more casual tables for two, perfect for dates, while couples and groups can enjoy the more upscale backroom with the fireplace. The middle room is a classic marble bar with a large screen reserved for retro black and white films, perfect for a casual drink in a luxurious setting. Settling in to the finery, start with the oysters, either fresh or dressed Rockefeller, Japanese, Creole, or Peruvian. Taste Maine in the crab claws, the classic crabcake, or a crab Oscar, the gluten-free and rarer alternative to the crabcake. The six-ounce Maine lobster tail is the most popular addition to the steak, which is sourced from hand selected cattle on family-owned farms and ranches around the state. 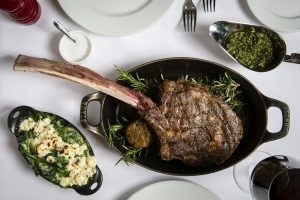 To splurge, order the Tomahawk rib-eye, which at 32 ounces can sate two. No sauce is needed for this bone-in cut, though there are options available, including black truffle butter, classic béarnaise, cognac peppercorn demi, or sherry mushroom ragout. The winter truffle mac and cheese is a bit heavy and rich, so try Brussel sprouts or spinach. There are vegetarian options like the tableside Caesar but seafood shines as an alternative with moules frites (mussels & fries), made with champagne, jalapeños, garlic, and hand cut fries. The aperitifs are lovely; the manhattans are the star cocktail. Happy hour will afford you a taste with cocktails around $15 and a glass of good wine averaging $20, but if you have the budget it’s worth every bite. Service had a college town feel but with time, educated and sophisticated staff can make Steakhouse No. 316 the Flagstaff-esque classic gem of steakhouses and Pearl Street.